Capable of testing any 1-12 cylinder, 4-cycle engine, this innovative software features a custom interface that includes easy-to-use Direct-Click menus that allow you to select from a wide variety of parts – or enter custom specs. DeskTop Dyno5 also includes several calculators to aid you with detailed engine analysis, including a CamMath QuickCalculator, Induction-Flow Calculator and an Air Flow Pressure-Drop Calculator. Now you can dyno test your next engine project BEFORE you even build it. The DynoSim5 software can accurately simulate any 4-cycle engine – including turbo, supercharged, nitrous and alternative fuel applications. Features include hundreds of new engines, advanced modeling, expanded results graphs and tables, comprehensive printouts, automatic updating over the web, and more. As a supplement to DynoSim5, we now offer CamDisk8 that will automatically install additional cam files to the cam library created when you installed DynoSim5. With this additional disk, you will have access to over 6,000 camshafts that you can search, load and test in any simulated engine. For the competitive engine builder, time is money. Thanks to the Dynomation-5 Wave Action Engine Simulation, you can reduce the cost and time of engine development, while maintaining your competitive edge. By letting you peer inside a running engine, this advanced engine simulation reveals live pressure waves and mass flow in cylinders and engine passages. While Dynomation- 5 will accurately display how much power your engines makes, it will also show you where and how this power is achieved. 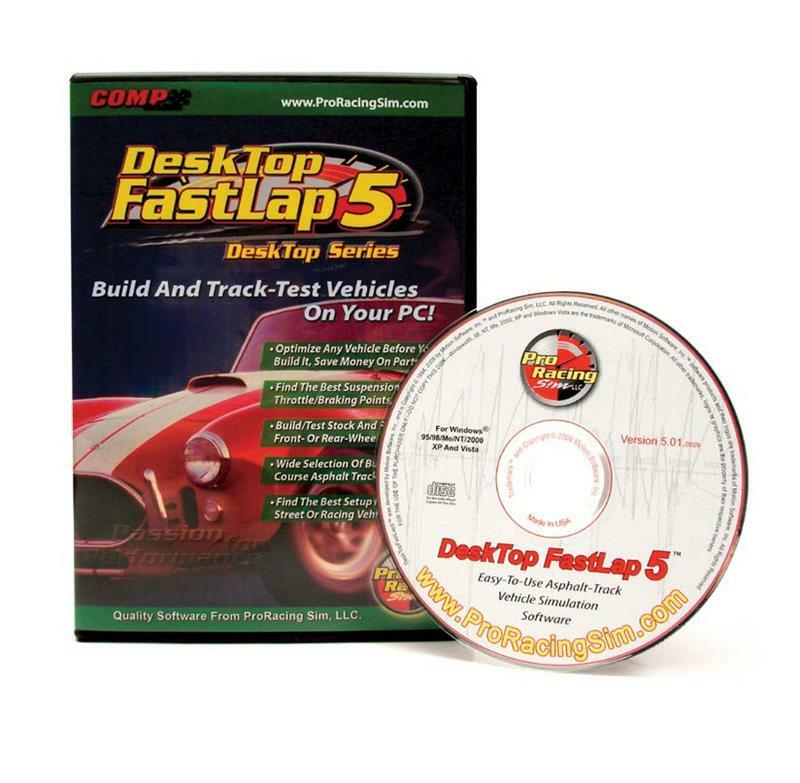 Rather than making trial runs at the track to determine the best setup up for your hot rod, motorcycle or dragster, why not save money and time by doing it all on your Windows-equipped PC? DeskTop Drag5 is an inexpensive, yet highly-accurate 1/4- and 1/8-mile drag race simulation that allows you to analyze the winning potential of your vehicle by selecting various parts from built-in menus – or by entering your own custom specs. With this advanced software you can model virtually any vehicle’s design, weight, frontal area, aero drag, wheelbase, tires and even driving style. Features advanced graphics that display ET, mph, engine and clutch (trans input shaft) RPM, acceleration, aero drag, tire slip, etc. In the past, finding the optimal chassis, driveline, gear ratios and other characteristics for desired street or drag strip performance was an expensive process characterized by trial-and-error – but not anymore. With DragSim5 you can assemble and test the performance of any vehicle imaginable on a 1/8 or 1/4-mile strip. A pop-up TimeSlip provides an easy-to-read visual summary of overall vehicle performance. Also included is the sophisticated Traction Calculator that optimizes tire/track modeling and improves overall simulation accuracy. Using the latest in performance simulation technology, DeskTop FastLap5 analyzes the handling capability of any vehicle on any closed-course, asphalt track. This top-of-the-line software can perform a comprehensive turn-by-turn analysis of any vehicle provide you with the best chassis and vehicle setup. It can also run an extensive simulation and display lap times and full vehicle “telemetry” to within a small percentage of true track-test data. Once you choose your setup combination, DeskTop FastLap5 will take your vehicle through a “hot lap” with instant results. Building a well-suited vehicle for road racing competition is a never-ending search for the perfect combination of suspension design, tires, gear ratios, braking points, steering path and a hundred other variables. Thanks to FastLapSim5, you can accurately simulate the complex interaction of forces, speeds, and accelerations generated by stock, high-performance, or all-out race vehicles. This advanced software also features the Pro Tools Kit, which includes such enhanced features as DataZones, real time data display, spring/damper calculator, ProData Display and ProPrinting.